Poinsettia variations patented by the Eckes family. Image: US Patent & Trademark Office. We give them, we get them, we try to keep them going through the holiday season. Those little potted plants of red and cream and green have come to symbolize Christmas more than any other plant, but why? And what do they have to do with Charleston? Native to Mexico, where is is known as La Flor de la Nochebuena (Flower of the Holy Night, or Christmas Eve), the Poinsettia is scientifically known as Euphorbia pulcherrima. Cultivation of poinsettias has been traced back to the Aztecs, who used the leaves to create reddish-purple dyes for fabrics and the white sticky sap to for medicinal purposes, including to help control fever. It's actually a small tropical tree: in the wild or planted in tropical climates, the poinsettia can reach heights of twelve feet with leaves measuring six to eight inches across. The Poinsettia blooms only in December and has been used to decorate churches as part of religious ceremonies for centuries. 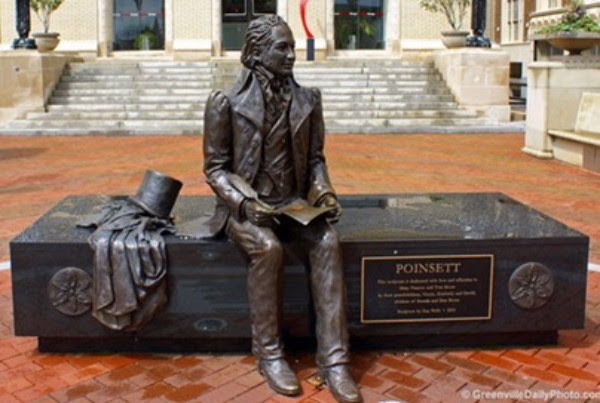 Joel Poinsett sculpture in downtown Greenville, SC. Photo: GreenvilleDailyPhoto.com. The Poinsettia is named after Charleston-born Dr. Joel Roberts Poinsett, a physician, statesman, and amatuer botanist, who first introdued the plant to this country and whose death is memorialized by National Poinsettia Day on December 12th. As the first United States ambassador to Mexico, he discovered a shrub with brilliant red leaves growing along the side of the road in Taxco, Mexico, in December, 1828. He sent cuttings back to South Carolina, where he continued to study and breed this unusual plant. (The flowers, by the way, are the tiny white-yellow buds in the center of the plant surrounded by colored leaves, or bracts.) Many botanists at the time considered it a weed but it soon gained acceptance here as a holiday plant, despite its short bloom time. It wasn't until the 1960s that horticulturists were able to successfully breed specimens that bloomed for more than a few days, and now they are the highest selling flowering potted plant by far (the Easter Lily runs a distant second). The Paul Ecke Ranch in Southern California produced the majority of Poinsettias for nearly a century, having a virtual monopoly on the industry as they owned patents on over a hundred varieties featuring an array of colors and foliage shapes. Red is still the most popular color, although the cream-colored ones are very pretty as well; if you thought those blue-colored Poinsettias look rather suspect--well, that's a designer color created with dyes...surprise, surprise. Left: William Harvey House (ca 1757) at 110 Broad Street, Charleston (photographer Charles N. Bayless, 1933, HABS, LOC). 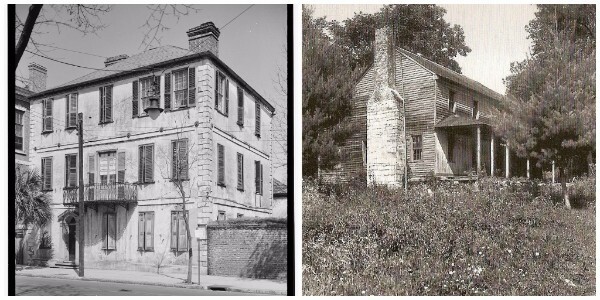 Right: Summer home of Joel & Mary Poinsett in Greenville County, no longer standing (William B. Coxe Collection, Greenville County Historical Society). In 1830, Poinsett returned to Charleston where he later married Mary Izard Pringle (1780-1857). The Izards were the second owners of the stately William Harvey House at 110 Broad Street; Ralph Stead Izard sold the home in 1837 to his aunt Mary and her husband Joel Poinsett, where they lived for many years (above, left). Joel Poinsett also had a plantation on the PeeDee near Georgetown and the couple made summer homes in the Upstate outside of Greenville (above, right). Throughout his life, Poinsett was an eternal public servant. Not only was he ambassador to several countries, he served in the South Carolina legislature as well as the United States Congress and was appointed Secretary of War. He was responsible for building the oldest bridge in South Carolina--and possibly the southeast--on the road leading from Columbia to Saluda Mountain. 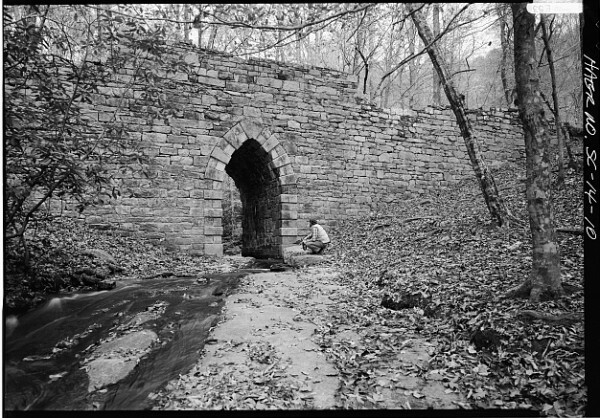 The stone Poinsett Bridge in Greenville County is famous for its Gothic arch; it is listed on the National Register and is part of the Poinsett Bridge Heritage Preserve. The "weird and beautiful" Poinsett State Park in the High Hills of Santee in Sumter County, best known for its botanical oddities, is named for Dr. Poinsett as well. It was built in the 1930s by the Civil Conservation Corps and was just this year listed on the National Register. Both of these places would be great options for a holiday hike...who's in? Poinsett Bridge, SC Route 42. Photo by Jack E. Boucher, 1986. HAER, LOC.